Printing and albums by MacMurray Press, NY. The liner notes reference this as being recorded live at the Tick Tock; a recently found contact sheet containing other photos from the same night confirms that. Also, there is a reference in a Saints marketing brochure of the same era to it being produced by RCA Victor, and while the matrix numbers are consistent with RCA Victor “custom” numbers, there is no indication on the package that RCA Victor was involved. 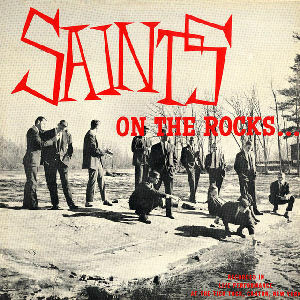 The liner notes say that this is the first time the Saints “hold center stage on a recording” despite the existence of the earlier Saints-only record, Saints. Also, there is a reference in a Saints marketing brochure of the same era to this being the “fourth” album. However, it can only be the fourth if the 1954 recording of the Saints WEEI-Boston radio broadcast “Transcribed” is included, even though it was never released commercially.